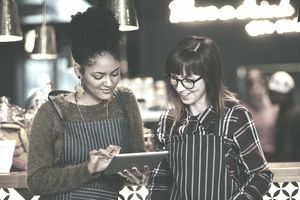 As the internet has rapidly replaced the yellow pages for finding local business information, it is more important than ever to have an online presence for your restaurant. An informative, attractive website can attract new customers. Restaurant websites range in price from free — thanks to open source sites — to thousands of dollars. About us: This is a good place to offer a brief history of your restaurant – what inspired you to open a restaurant, any pertinent history to the location, etc. Contact information: This is where you feature the restaurant's phone number, email, manager/owners name, and directions. Menu: This is the main things people are looking for when they visit your restaurant website. Make sure the web pages that feature your menus are clean and easy to read. Avoid PDFs or scanned copies of your paper menu. Photo gallery: Add some pictures of your dining room, pub/bar area, customers (don’t forget to ask permission before posting their pictures online) and outside dining area. If time permits, update your photos periodically to avoid looking stagnant. Specials and upcoming events: If you can spare the time or delegate the task to someone else, updating your lunch and dinner specials each day on your website is a great way to promote your restaurant. The same is true for promoting special events, like Valentine’s Day or Mother’s Day. Link to your social media sites: Facebook and Twitter offer free advertising opportunities for your restaurant and reach huge numbers of people. You can provide information about local hotels, movie theaters, chambers of commerce and other surrounding businesses, and in turn, ask that they add a link to your restaurant. Do the same for area tourist attractions in the area such as parks, zoos, or stadiums. Do you offer catering services? Do you have a banquet room? Dedicate a webpage to these services, including photos of buffet tables, the room set up for different events (weddings, meetings, holiday parties).